Cèide Fields ~ 3000 b.c. Five thousand years ago a stone age farming community lived in what is now called the Cèide (kay-jeh) Fields, five miles west of Ballycastle. After the settlement was deserted a bog covered the fields to a depth of up to four meters. A family dwelling, an animal pen, and approximately ten square kilometers have been mapped and excavated. The plan on the stamp shows the location of stone walls under the bog. It is similar to the plan in the brochure compiled by Dr. Caulfield and distributed by the office of Public Works of the Republic of Ireland. 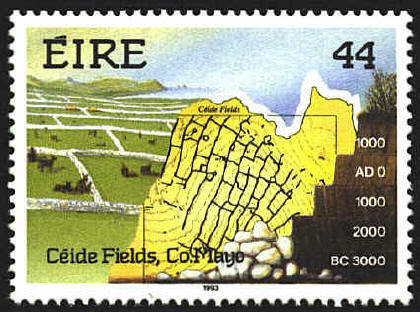 The picture on the stamp shows what the walled fields would have looked like before the bog covered them.